Setting the dance scene on fire. After several years of flying high, Scooter needed something new to keep the fans hyped. Sure, fast beats and the occasional crooning ballad can lure innocent victims of sound in, but there needs to be something unique to keep them from running away. And what better to use than the sound of yesterday, today, and the future: the electric guitar. Yeah, the stuff that made 80s hair bands as briefly exciting as they once were. This is exactly what those three Hamburg pals decided to add to their already rockin' rave music, resulting in what could be considered as the first popular rock'n'rave tune. As the Radio Edit begins, quietly, frontman H.P. Baxxter tells us to "switch off the lights... and close your eyes... feel the energy inside..." before saying the word "chillibow" three times. I have no idea what that means, but when he suddenly shouts "FIRE! ", you don't ask questions. In comes the rockin' electric guitar, followed by some standard bass and beats, and you have yourself the makings of a rock/trance tune. H.P. shouts some more things over a trance synth, including a pretty wild tongue twister, before it's back to the electric guitar. Repeat ad nauseum. When I first heard this song about ten years ago, I didn't really care for it back then. Listening to it again now... I feel the same way. The guitar is a nice gimmick, but considering it gets quite dry and dull after a few appearances (and it's just the same few seconds looped repeatedly for the chorus), I can't remain interested for very long. It's a good effort, but certainly not why I would keep listening to Scooter. The Extended Emergency mix somehow makes this unnecessarily long song even longer. This single also features a couple of extra songs. Choir Dance is the more notable of the two, combining a wild organ, an uplifting plucked melody, and a real singing choir! It's pretty damn funky and definitely worth a listen. We also get Fire Dub 1, which is a retooling of the instrumental elements of the original Fire into something new. I wouldn't even remotely recommend this if it weren't for the vocals in the middle, where H.P. 's tongue twister lyrics have been vocoded so they sound like they're being produced from an electric guitar themselves! That's the only reason to check this one out. 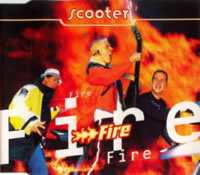 "Fire" has never been my favourite Scooter single, although it could be yours if you happen to be a hard rocker. They used the electric guitar sporadically throughout the rest of their career thus far, but they learned not to rely on it, and perhaps that is wise. Check this one out only if you're interested in hearing a more rough and rock-based sound.